I am often asked about the City’s new study: Growing Up – Planning for Children in New Vertical Communities; what does it mean for development and what is going to change. Why did the city introduce the guidelines? The City of Toronto introduced the new guidelines as a response to the lack of new condo units working well for families with children. In the past, families with children could simply live in houses, but for many that is no longer an affordable option. 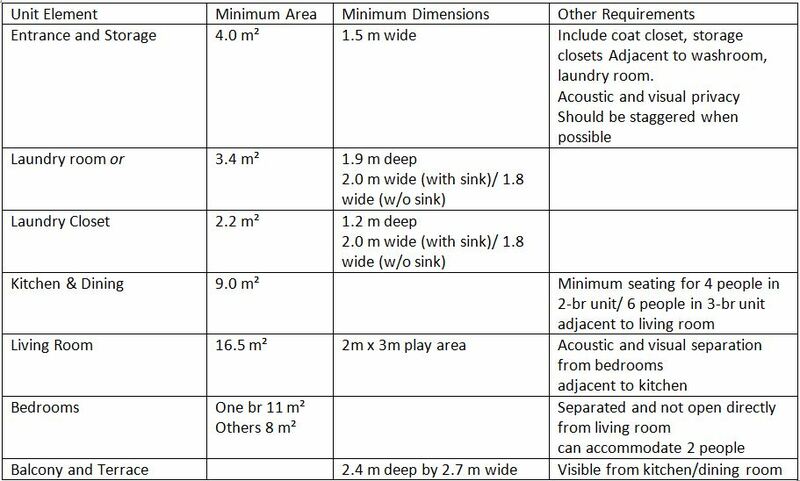 The Guidelines aim to address three major issues: (a) there are not enough 2- and 3-bedroom units; (b) the large units that do get built don’t work well for families; and (c) the buildings and neighbourhoods themselves lack in essential amenities for children and parents. The Guidelines have not been incorporated into zoning or Secondary Plans and therefore are not mandatory, but developments that voluntarily comply to the guidelines (fully or partially) will enjoy greater support from the city. They apply to mid-rise and tall buildings with 20 units or more, which is also the cut-off for obligatory provision of amenity spaces. What are the requirements? How they impact design? The guidelines are divided to three spheres: the neighbourhood, the building, and the unit. The neighbourhood level guidelines are mostly for the city itself, but they will also impact large master-planned developments. Developments are required to have 25% Large Units: 10% 3-bedroom and 15% 2-bedroom units. When possible, these units should be grouped together (to encourage socializing and sense of community), and be provided with direct access to the ground/outdoor amenity space. The minimum sizes of the Large Units are 87 m² (936 sf) for a 2-bedroom unit and 100 m² (1140 sf) for a 3-bedroom unit. The areas are measured from the interior of walls. To facilitate future consolidation of small units into large units, the construction should use column instead of shear walls, or provide demisable partitions adjacent to the corridor. To allow for general flexibility in the future, vertical risers should be located in the core and not within units. To encourage socializing, hallways should be wide near elevator cores and Large Units. Mid-rise buildings and base parts of tall buildings should be configured to frame outdoor spaces. Developments that would be required to provide Parkland Dedication and that are further than 500m from an existing park are required to provide Privately Owned Publicly Accessible Spaces such as courtyards, forecourts, mid-block walkways, plazas and landscaped setbacks. Buildings should provide wash-up rooms for bikes, strollers and pets, storage room for strollers and wheeled toys, a work room for messy activities, and a pet relief area for dogs.